Crystal of the Day for Monday 9 September 2013 is Mookaite Jasper. Mookaite Crystals are very varied in colour from Red, purple through to yellow. Very calming and grounding. Excellent for reducing the electrical energy around the body. Also helps to reduce acids..
Mookaite (Australian Jasper) is a very grounding crystal and it helps with self-esteem. 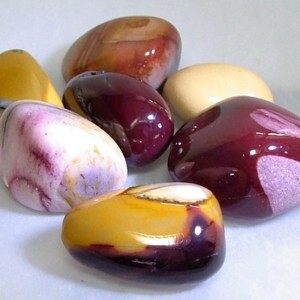 Mookaite can help with dreams and meditation and moving forward in life. It helps with fear and depression, has been used for the thyroid gland, and also helps one to be more social, encouraging new perception and communication skills. Mookaite helps one experiencing new circumstances, soothing erratic behaviour and helping one to remain calm. Is extremely good to use in negative situations, as it provides a shield over the user whilst working to neutralise the environment. Mookaite assists with decision making, guiding the user to the answer that is best for them at that point in time. It can also be used for discretion, when helping others with their problems. It promotes balance for the day and allows one to remain open and honest about all new ideas. Mookaite is a great companion for those who are alone or just feeling lonely. For people who work with children or have children of their own, this is a brilliant stone to help one to understand why the child is behaving in a detrimental manner, and enables one to modify this behaviour to a beneficial state without the child noticing the change. Mookaite is also a great stone to help those who are kind to all except themselves, become kind to themselves too. Helps one to find employment, enhancing excitement and happiness toward the work situation. In Australia, mookaite was and still is considered to be a healing stone that bestows strength. It is said to shield the wearer from difficult situations and to connect us to loved ones who have passed away. It is believed to bring us into the “here and now,” aiding with problem assessment and decision making. Mookaite can be used to communicate with animals. It enhances creativity & the “flow” of new ideas, and also assists one to used these ideas in the appropriate manner to achieve maximum results. Mookaite can also be used in the treatment of fat disorders & disorders of the stomach. Aids in the prevention and healing of hernias. It also helps to relieve water retention. As this piece is an Australian Mookaite it also has strong links to the Dream time and also Indigenous Australian have used Mookaite as a stone for regeneration and healing the everyday wounds.